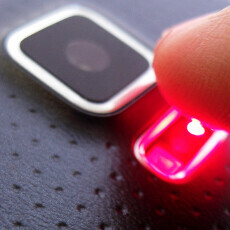 Samsung went bonkers on biometrics with the Galaxy S5, equipping it not only with a Finger Scanner that lets you unlock the phone, or authorize secure payments, but also with a heart rate sensor. The optical pulse meter is situated next to the LED flash on the back, and is very ergonomic to use, as it requires a simple stretch of your index finger. The heart rate sensor is folded into Samsung's S Health app, which offers things like a step counter, via the built-in pedometer, as well as calorie counters, fitness tips, and a general worry about your wellbeing.